Download "Summary of Cover Commercial Retail Policy"
2 the UK Loss of metered water Fixed limit of 2,500 Following damage by escape of Fixed limit of 5,000 water as insured by this policy, the cost of locating the damage and repairing it Damage to lottery equipment Included within the Contents sum insured if declared Personal belongings of employees Fixed limit of 500 per person and visitors Stock at your premises, including The amount you require (as specified within wines and spirits, tobacco, Contents) cigarettes and cigars. Seasonal increase Sums insured for Stock are increased by 50% for up to 90 days during the period of insurance. 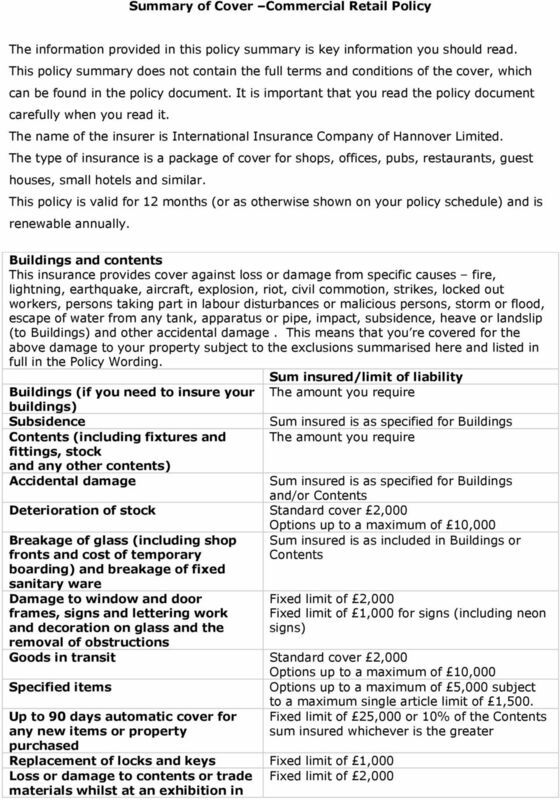 Also covered: Automatic reinstatement of cover, removal of debris, professional fees, rent cover, temporary cover for property elsewhere whilst being repaired, accidental damage to pipes and cables (all subject to specific limits). Security conditions, vehicle security conditions and minimum standards of control apply. Special terms apply to empty properties. Losses arising from existing defects, wear and tear, faulty design, faulty materials, faulty workmanship are excluded. Losses arising from acts of war and/or terrorism or nuclear causes are excluded. 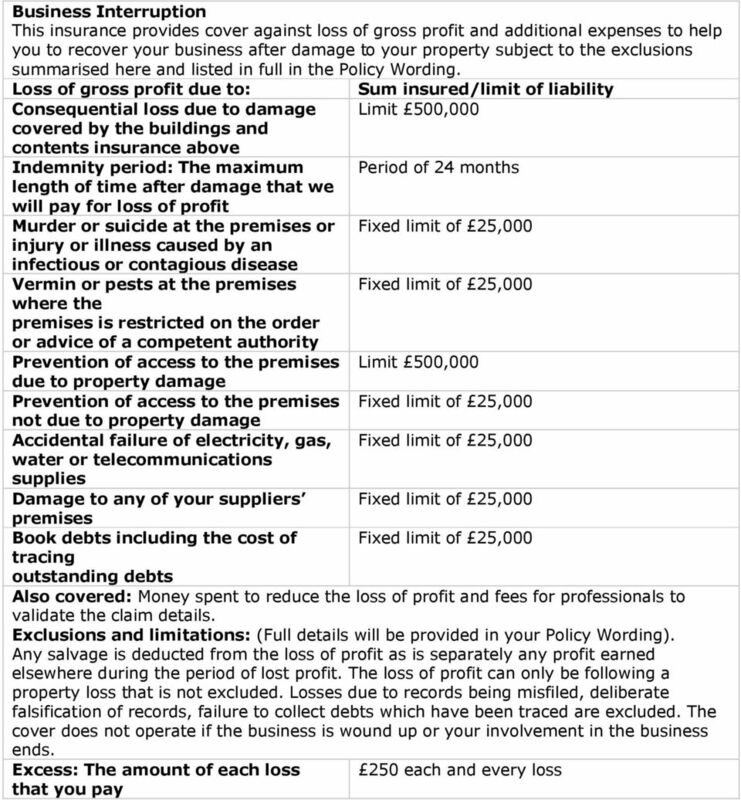 5 Business Interruption Loss of Licence This insurance provides cover against loss Limit 100,000 of gross profit and additional expenses if your licence is removed, forfeited or suspended by the Licensing Authority. The licence relates to one issued under the Licensing Act 2003 (or its Scottish equivalent) or any subsequent legislation. Exclusions and limitations: (Full details will be provided in your Policy Wording) Any period of closure not required by law. Any premises not maintained in a good state of sanitary condition or repair. Where the licence is removed, forfeited or suspended because of your neglect, misconduct or failure to take the necessary act to keep the licence in force. Any direction or requirement of the licensing or other authority which is not complied with. 7 Installation of immobiliser Overnight garaging are securely locked. If you have an immobiliser installed, it must be activated when the vehicle or trailer is unattended. Between 7.00 pm and 7.00 am, unattended vehicles and trailers must be garaged in enclosed premises that are either securely locked or constantly attended by a watchman. 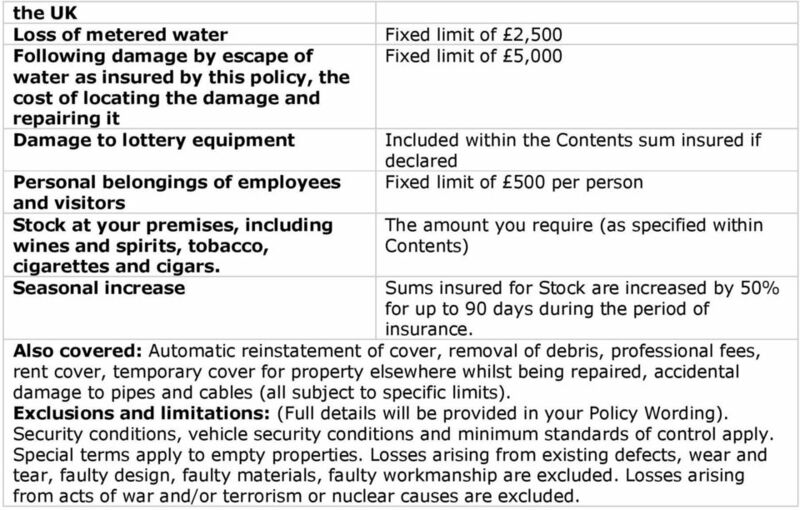 The policy is a complex document and contains a large number of specific items relevant in specific circumstances, depending on the nature of the risks being insured and those extensions requested. 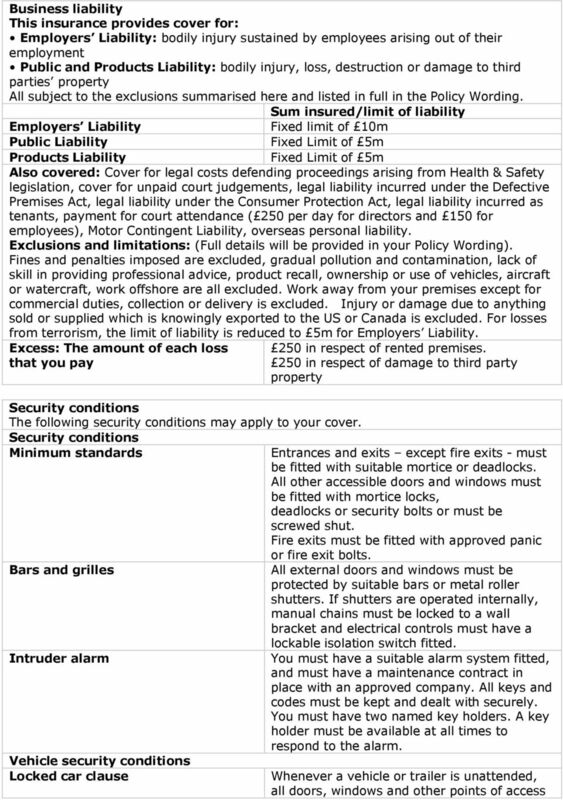 The policy may also contain warranties describing actions that you must take or avoid for any cover to operate. 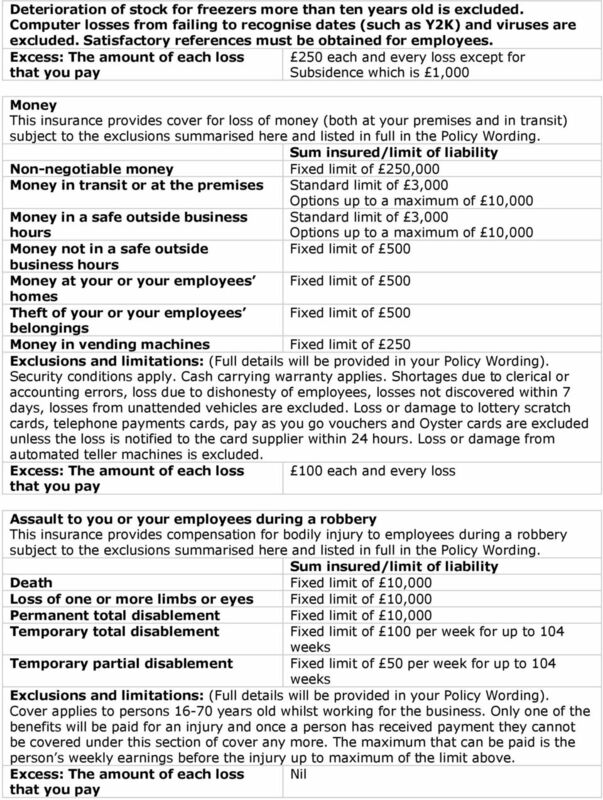 If the amount insured is not as much as the values of the items you are trying to insure, then any claim may not be payable in full.